We often take our world for granted, wishing instead for something more fantastical, like the magical world of Tolkien’s Middle Earth, or C.S Lewis’s Narnia. But what we don’t realize is that we have our fairytale-like places right here, within grasp in the real world. Through these eight sites, let go of the imaginary and see the world for what it is: a land full of wonder and science with a magic of its own. No, this is not a Dr. Seuss set. This park is made up of 350 hectares of garden, with a wide variety of different flora and fauna. The Miharashi no Oka Kochia (red) is perhaps the most unusual. These visually furry plants give the impression that the fields are on fire. Kochia Carnival is an where people get together to see the flowers bloom bright red and orange. The best time to view these magnificent plants is during the Autumn months (September to October) when they bloom to match the fall season. This sorbet-looking mountain formation is known for its layers of vibrant colors, smooth and sharp surfaces and magnificent heights. Located in the Sunan and Linze counties, the landform is a result of sandstone and other mineral deposits that have occurred over 24 million years. A burst of color in a rocky landscape, this site is not to be missed! Meteora translates to “middle of the sky,” suspended in the air” and “In the heavens above.” But words don’t begin to describe the awe-inspiring location of this natural wonder. A UNESCO World Heritage Site, Meteora is a formation of massive monolithic pillars, hills, and rounded boulders. It is widely associated with the six monasteries built in the area. The sacred buildings add on to the serene feel of the beautiful setting. This fantastical rainbow pool is the largest hot spring in the U.S and the third largest in the world. Approximately 370 feet in diameter, the spring is 160 feet deep, releasing around 560 US Gallons of 160 °F water per minute. What looks like a photoshopped photo is actually the result of “microbial mats” or bacteria around the water, rich in minerals. The mats produce the vibrant colors; orange and red in the summer and dark green during the winter. The springs may look fantastical, but it’s all nature and science! Meaning”Cotton Castle” in Turkish, the Pamukkale’s terraces reminisce soft clouds and blue skies. The terraces while look soft, are made of a sedimentary rock called travertine deposited by water as a soft gel which then crystallizes into travertine. Hence the smooth, surreal appearance. Due to limited water supply and erosion, visitors are not allowed access to the terraces, having to stay on the pathways. However, you can dip your feet into the small pools and enjoy the warm waters. This “cave of the mountain river” is the world’s largest known cave passage cross-section. Like something from an ancient myth, the cave features a beach, plant life, and great lighting. The cave was found in 1991 by local man Hồ Khanh. People usually stayed clear of the cave because of the haunting sounds of the wind and roar of the cave’s river coming from the entrance. With its vast interior, the echo must be magnificent! To visit the cave, visitors need a permit, which has limited availability. For the 2017 season (February to August) only 800 permits are available. It is closed after August due to torrential rains which make it inaccessible. 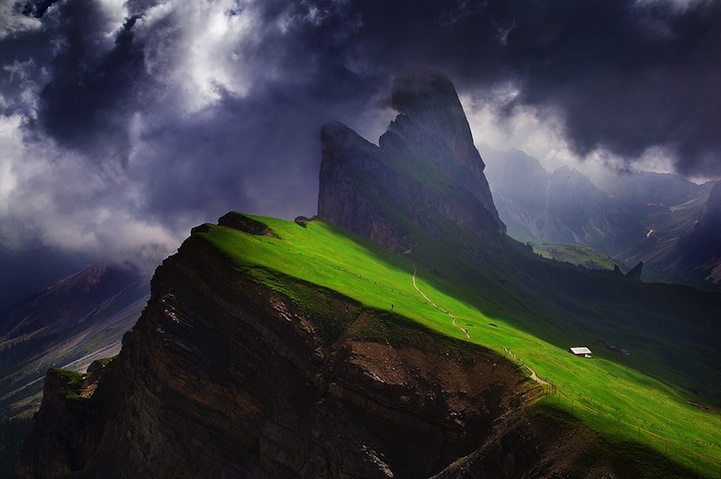 Located within the Dolomites mountain range in Italy, these breathtaking mountains provide a unique angle of which to view the world. Part of the Dolomiti Bellunesi National Park, this UNESCO world heritage site offers hiking through beautiful mountain ranges, past rivers and streams and various flora and fauna. Feel like you’re on a journey through Middle-Earth as you trek these gorgeous slopes. Although this lake was man-made with the construction of the Bighorn Dam, it’s the lakes natural phenomenon that draws in visitors. The release of methane gas from decaying plants on the lake bed results in the creation of bubbles. 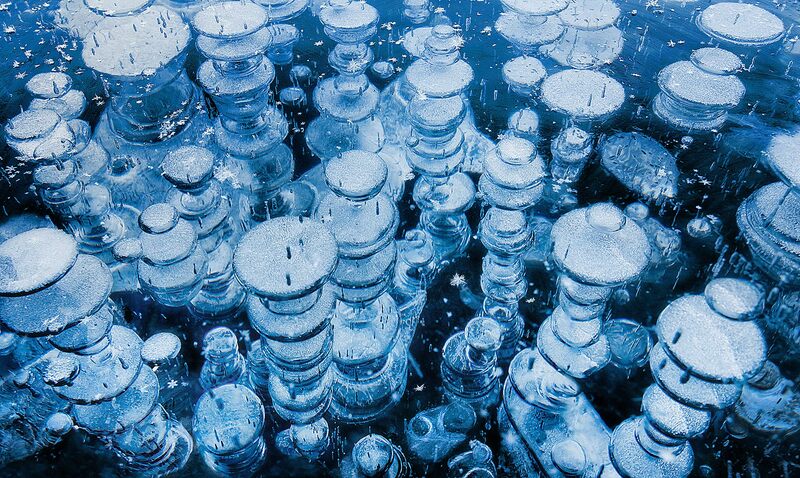 As the lake freezes over, the bubbles become trapped, resulting in this magical sight.